“Antonio Castro lives just outside San Juan, the capital of Puerto Rico, on the far east side of the island. Since Hurricane María made landfall on the US territory in late September, conditions have been difficult for Antonio and his family. Like hundreds of thousands of other workers and youth on the island, Antonio continues to struggle without the basic amenities of modern life, including electricity and running water. Antonio will be regularly reporting for the World Socialist Web Site on the unfolding crisis in Puerto Rico. More than four months have passed since Hurricane Maria hit Puerto Rico, and for many of us it seems like nothing has changed since the first days. Electricity has been slowly restored and limited to places mainly in urban centers. A great part of the population, especially people who live in rural areas, are still living without power and potable water. For many, the only shelter they have from the elements is provided by a blue tarp covering where the roof used to be. The prevailing conditions and the sense of government indifference to the recovery efforts has been fueling social anger. 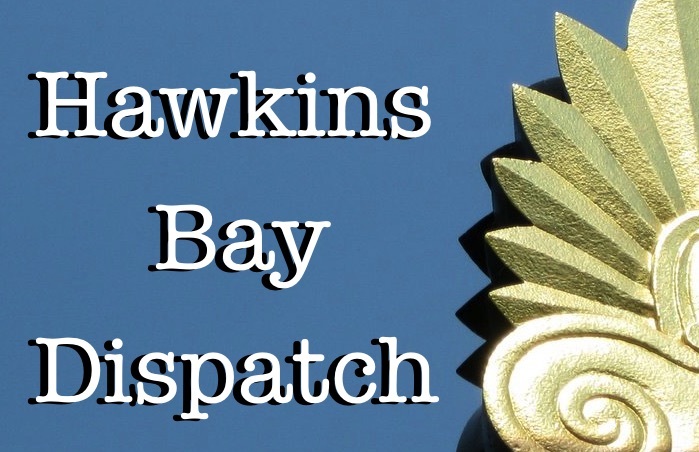 A popular local news radio station that I listen to regularly has started airing calls from residents who talk about what their situation has been like since Maria. All of the calls are stories of people asking how much longer they will have to live without electricity. One can hear anger and anguish in their voices, especially the ones for whom power is a necessity due to medical conditions. The situation is difficult even for those who own emergency generators, as it is very expensive to keep them running. Gasoline and diesel prices are very high and continue to rise every day. 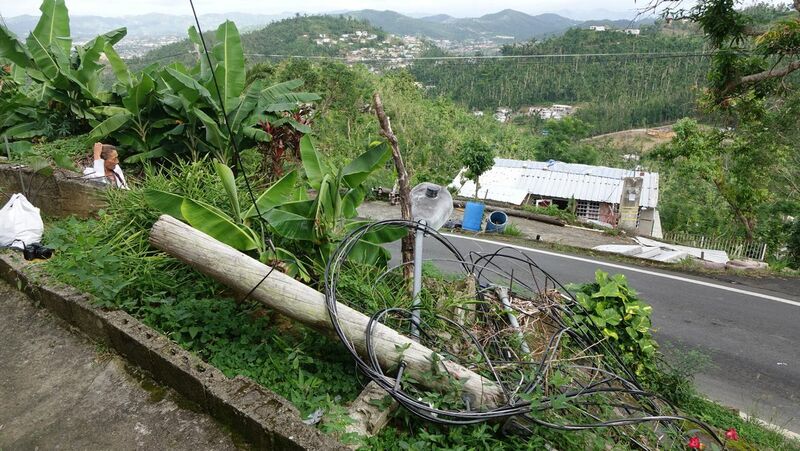 In the area where I live, a rural community in a city just outside of San Juan, bundles of cables and downed power posts can still be seen littered on roadsides. Some places are predicting that power might not be fixed until March or later. Lack of power also means lack of running water, since water pumps are needed for communities high in the mountains. This means that we have to save rainwater for bathing, do our washing by hand in a nearby creek and use bottled water for cooking. Washboards are the new rage. It is a common sight to see people with buckets when it rains or after one of the many trips to the river. My grandmother and other elders from the area comment on how life has returned to how it was when they were kids back in the 1930s and 1940s. The excuse that government officials give for the slow recovery is a lack of materials. It is hard to understand how materials such as powerline poles could not be acquired after four months. Meanwhile, we are just left to wait and hope that someday the power comes back on. Communities are starting to call for protests against the slow recovery process of the electrical grid. 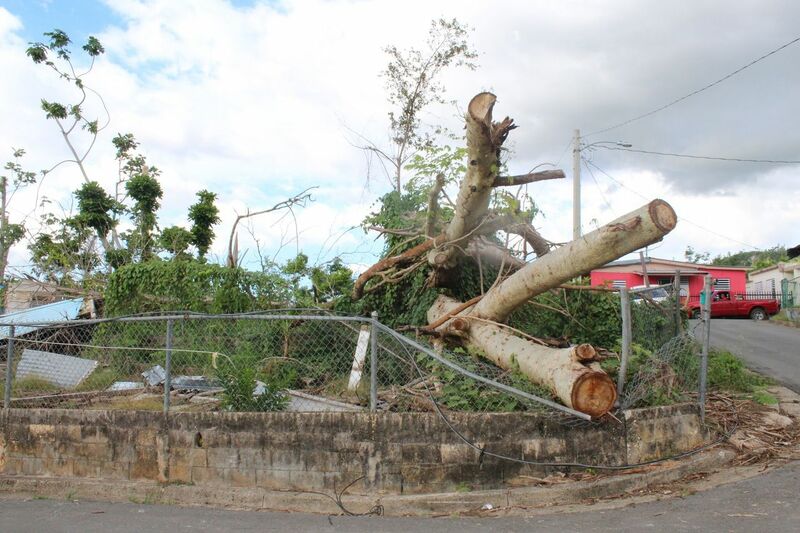 On January 26, residents of the community “El Verde” in Caguas were protesting and demanding that electricity be restored immediately. Irma trash still fills Keys canals. One has 16 sunken RVs. Is cleanup finally coming? 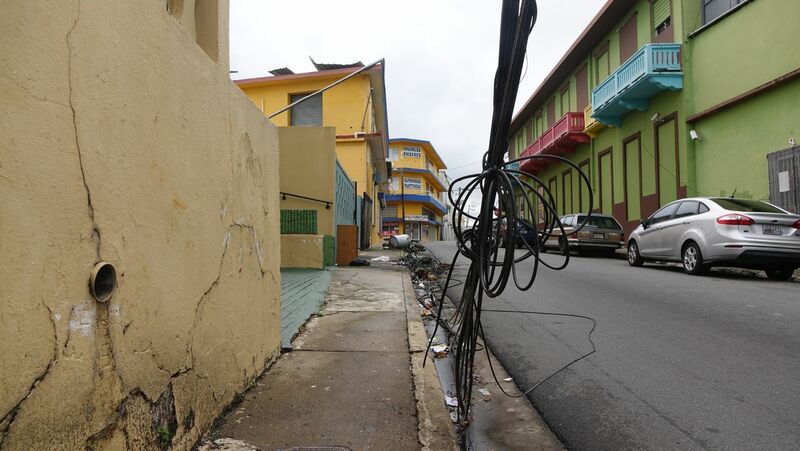 Like the residents of this area, many more across the island are starting to express their anger and demanding the immediate restoration of the electrical grid. It is unacceptable that in the US, the richest and most powerful country in the world, citizens are living in third world conditions more than a hundred days since the natural disaster. Schools across the island have started to hold limited classes only until midday due to lack of water and power. The crisis has been used as an excuse for the government to shut down many schools instead of fixing them and making education accessible for students. Photo: Carlos Giusti, AP FILE – In this Oct. 19, 2017 file photo, a brigade from the Electric Power Authority repairs distribution lines damaged by Hurricane Maria in the Cantera community of San Juan, Puerto Rico. The announcement that Puerto Rico’s governor is moving to privatize the U.S. territory’s public power company has many on the island of 3.3 million people asking whether this will finally bring them more affordable electric bills and more reliable service. Thankfully, the local community school in which my little cousin studies was able to reopen, but only thanks to the efforts of teachers and parents. They cleared debris themselves, cleaned classrooms and resisted local Department of Education authorities who did not wanted to reopen the school. While the majority of the population continues to live in precarious conditions, Governor Roselló recently announced plans to sell off the public electric utility called PREPA in order to “free” the population from the “poor” and “inefficient” service that the public utility provides. I think this message is in part a distraction from the real problems underlying the crisis. That is, where are the resources that are needed to rebuild the electrical grid and the other major infrastructure problems in Puerto Rico? The way in which the local and federal government have handled the devastation of this natural disaster has confirmed for me that capitalism in incapable of fulfilling the basic necessities of society, since its primary function is the enrichment of the financial elite at the expense of workers. The passing of Hurricane Maria intensified the already existing inequality and economic catastrophe in which Puerto Rico has been trapped for many years.